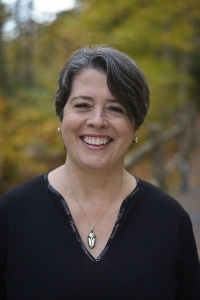 A graduate of Duke and Yale, Eileen Flanagan is the award-winning author of three books and scores of articles. 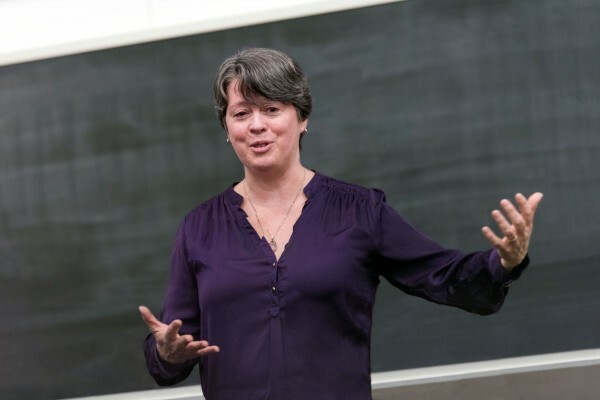 In addition to helping people to make their activism more effective through her online courses, she speaks to international audiences on how to build a spiritually grounded and effective climate justice movement. 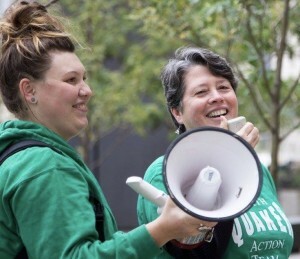 For five years, she served as board chair of Earth Quaker Action Team, a scrappy little group which successfully pressured one of the largest banks in the US to stop financing mountaintop removal coal mining. Her current work focused on the intersection of racial and environmental justice. (and later Yale for grad school). These experiences planted an early awareness of economic inequality, which was nurtured by two and a half years as a Peace Corps Volunteer in Botswana. Living in southern Africa during apartheid, with friends who had fled that brutal regime, inspired my first activism when I came back to the US, as well as a lifelong concern about racism, which I taught about for several years on the university level. My concern for the natural world also has deep roots. Camping with the Girl Scouts and then my high school Outing Club, I fell in love with the woods, which is where I have always felt closest to the Divine. Initially I expressed my desire to protect the earth by carrying canvass shopping bags and trying to limit my consumption, but eventually I came to see these individual acts as spiritual practices–choices that helped me to live in integrity–not as viable ways of actually limiting environmental destruction, particularly climate change. By my late forties, I despaired that any of my work to make the world a better place had made a difference. To make matters worse, my first two books and much of my teaching had been about how to listen for and follow a calling, and I did not feel like I was walking my own talk. My memoir Renewable: One Woman’s Search for Simplicity, Faithfulness, and Hope tells the story of how I navigated this period of inner-struggle and found a new midlife calling that integrated my passion for justice, earthcare, and spirituality, while teaching me a whole new, more effective way to work for positive change. From 2013 to 2018, I served as board chair of Earth Quaker Action Team (EQAT, pronounced “equate”), which uses nonviolent direct action to work for a just and sustainable economy. During my leadership, we won our campaign to get PNC Bank to pull out of financing mountaintop removal coal mining, and after a few months of discernment, began a new campaign to push Pennsylvania’s largest utility to make a major shift to local solar in a way that creates jobs and economic opportunity in low income neighborhoods, which have been hurt the most from the fossil fuel economy. After the 2016 presidential election, I felt a new calling to share what I have learned about effective and spiritually grounded activism through online courses. I found that many people were feeling as I did five years ago–discouraged by the state of the world and unsure how to help. It’s been a joy supporting over 700 activists from four continents! Would you like to receive my updates and resources? I was raised Roman Catholic but became a Quaker as a young adult. Visit my Quakerism in a Nutshell page if you think Quakers ride in horse and buggies. I have a half-sister who I didn’t know about growing up. While that story didn’t make it into the memoir, it did make it into the Huffington Post. I live in Philadelphia with my husband, Tom, our dog, Spud, and the stuff our kids left behind when they went to college. I make a mean Irish Whiskey cake, a tribute to my Irish grandparents.